i). 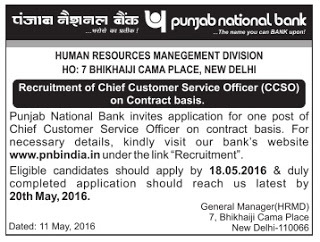 The eligible person should be retired officer in the rank of Chief General Manager or General Manager of a scheduled commercial bank other than Punjab National Bank. ii). The eligible person should have exposure in working of more than three areas of operations in banking such as General Banking, Credit, Foreign Exchange Operations, Treasury, Government Business, Merchant Banking, Credit Card Operations etc. iii). The appointment of Chief Customer Service Officer will be purely contractual in nature for a period of three years, extendable as per suitability criteria.